The rapid, unceasing proliferation of digital cameras over the last decade, both as actual camcorders and installed in mobile phones, has helped democratise the moving image. Anyone can capture any image they want and share it with the world in moments. Whilst this has radically reshaped how we relate to the world and the events that shape it - try to think of the last time a major news story broke without being accompanied by some amateur, grainy handheld footage - it can also rob the images themselves of meaning. The sheer volume of videos on YouTube that depict every aspect of human life from the most banal to the most cataclysmic, as well as the recent craze for faux-documentary realism in genre films like Paranormal Activity, dulls the impact of real, authentic footage by making the look and style feel commonplace. It takes something really extraordinary to break through that layer of complacency, to really make an impact. Emad Burnat and Guy Davidi's 5 Broken Cameras is one such extraordinary thing. Shot over several years on a number of cameras which, as the title suggests, were smashed or damaged along the way, the film started life in 2005 when Burnat's fourth son, Gibreel, was born. Burnat bought his first camera to record his son, as well as the lives of his family and friends in the West Bank village of Bil'in. At around the same time, Israelis began to bulldoze olive groves in order to make room for expansion of the West Bank barrier around a nearby settlement, cutting off the people of Bil'in from farm land that was vital to their survival. This sparked a long-running series of protests over the actions of the Israelis which Burnat was able to capture with great, often harrowing intimacy, putting them online or giving them to news agencies to raise awareness of what was happening. You could say that the the turn of events was immensely fortunate for the making of the film since the footage that was captured is often incredible, but that would ignore how tragically unfortunate the events themselves were for everyone involved. The structure of the film is simple, but incredibly elegant and ingenious in a quiet, unassuming manner. It unfolds more or less chronologically, breaking evenly up into five episodes, each of which builds to the moment when its respective camera gets damaged. Perhaps unsurprisingly, this tends to be due to the actions of the Israeli army, whose attempts to suppress the protesters are depicted in ugly, suffocating detail. Burnat places himself in considerable danger on multiple occasions, risking injury and death in order to capture what is happening to his home, his friends and his family, and this lends the film a tremendously claustrophobic intensity. It feels like embedded reportage, which it basically is, but it lacks the crucial thin, ineffable air of protection that we like to imagine surrounds journalists, or which they at least like to project. Although there is a clarity and natural artistry to Burnat's camerawork, it never feels like a distant account by an observer. It feels like a howl of pain right from the heart. Although the scenes of the protests are the most visceral and unnerving parts of the film, which is hardly surprising since they feature blood, tears and death, it's the quieter moments that mark the film as a special, deeply empathetic and humanistic work. Since the film has its origins in home movies, it chronicles the day to day existence of life in the West Bank away from the protests. In doing so, 5 Broken Cameras ends up showing a side of the Palestinian-Israeli conflict that is, quite honestly shamefully under-represented in the West. While the events surrounding Bil'in are undoubtedly extreme, the people themselves are just trying to live their lives, even as bullets fly around them. There's a great moment in which the camera captures Burnat and his friends building a concrete shack to place in the way of the construction, a tactic that works very briefly. While they get to work, the men joke and laugh, finding humour even as they prepare for yet another confrontation with the authorities. It's a brief scene but a vital one, since it says so much about the humanity of the people involved by contrasting their smiling faces against the sheer weight of the forces arrayed against them. It makes them more, and their situation immeasurably less, human. In addition to its depiction of the broader struggle, the film also focuses on the life of Gibreel as he grows from a baby to a young man who, in a perfect world, would enjoy a happy, untroubled childhood. Sadly, ours is a deeply imperfect world, and Gibreel grows up knowing more violence than anyone should have to experience in a whole lifetime. 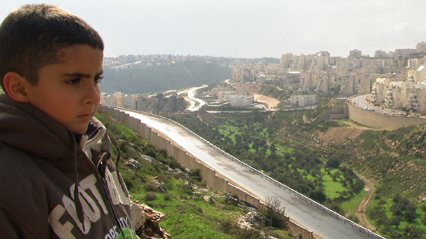 Burnat's voiceover conveys a great deal of frustration at the actions of the Israelis and the years spent waiting for a court order to move the wall to be put into effect, but also sadness at the world in which his son has to grow up. Both he and the audience can see Gibreel's dislike of the wall increase with each passing year, and it's painful to think about how many young people on both sides will grow up to propagate such animosity and hatred. Yet Gibreel is still just a boy, filled with potential, and his father seems to hold out hope that he will live to see a better world than the one he grew up in. 5 Broken Cameras is a remarkable film that captures the resilience of life in ways which are by turns lyrical, brutal, poetic and heartbreaking. It's an incredibly vital account of lives lived and lost in an extreme, horrible situation which also manages to find light amongst the rubble. It's also proof that works of great power and grace can come from something as simple as the desire to capture a baby's smiling face.